There are just some kinds of games that you (well, I) can’t say no to. One of those is sci-fi strategy games. I don’t know why I like them so much. Maybe it’s because my father gifted me the Dune books when I turned 13. Regardless, it should come as no surprise that Halcyon 6: Starbase Commander, made by developers Massive Damage, caught my eye. After spending some time with it, I’d say it was completely worth it. At some point hundred of years in the future, humanity reigns supreme across the galaxy, united in the Terran Federation. One of the main factors contributing in this supremacy are the ancient ruins of a precursor allien race. Through them, the humans have advanced technologically. We are the commander of the starbase Halcyon 6, located inside such a ruin. While researching it, the fleet stationed in our sector suddenly leaves. It is quickly ambushed by allien invaders and killed off. Soon, the whole federation is in ruins. However, Halcyon 6 still stands. Our job as leader of the base is to defend it from threats, while simultaneously continuing our research in order to combat the alliens. The gameplay of Halcyon 6 is split into two parts. The first part is very reminiscent of the new X-COM games. We use the materials that we have gathered in order to complete research, build new buildings in our base and recruit officers. Speaking of officers, there are three kinds. Tactical, Engineer and Scientist. Officers are used not only in space and ground combat, but also to build our base and conduct diplomacy. That makes them the most important resource of the game. Depending on the kind of officer we have, they have different ships and different abilities. Moreover, they can level up through combat. This unlocks more and more abilities for them. While we are upgrading our base and officers, we get to look at a star map. This map shows the location of our base, the location of enemy bases and fleets and, most importantly, the location of still-standing federation facilities. We can visit these facilities by sending fleets to them. Once there, we get to choose whether to keep the facilitiy running, getting materials from it but also endangering it, or evacuating it and adding its crew to ours. Finally, the star map is where we get our mission notifications. If we follow these, we usually end up in the second part of Halcyon 6’s gameplay, combat. 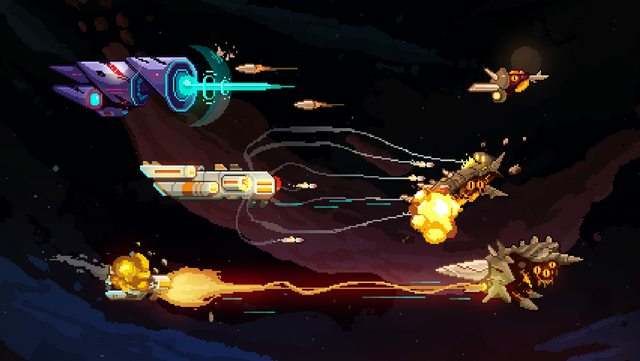 Combat in Halcyon 6 takes some nods from FTL. At most, combat is done in a 3v3 fashion, although early on 1v1 or 2v2 fights are more common. In combat, turn order is displayed at the bottom of the screen. Our ships, regardless of officer level or kind, will always have four moves. Tactical officer ships tend to have more aggresive, damaging moves, scientist ships have condition inducing moves and engineer ships have healing moves. While this is pretty straightforward, what really surprised me was how much nuance is hidden underneath all that. Moves from one ship can synergize with another and inflict more damage. There are status condition moves which alter either our ships or the enemy’s. Generally, there always new moves to discover, which really satisfied me. On top of ship combat, there is also ground combat, which functions in the same way. In terms of graphics and sound, the game’s artstyle is fantastic. It’s just full of 8-bit goodness, combined with great, fluid animation. The sound quality is also great. What really sealed the deal for me, however, was neither of those things. It was the writing. Halcyon 6 has the kind of writing that really makes each hero different and unique. Its narration manages to really draw you in and make you take in the whole universe and story. On the other hand, the game does have some issues. The most major one among those is how repetitive it can get after a point. Enemies stop becoming a threat and you just go through the motions. It’s still worth it for the story, but it does get a bit tedious. This is why, if you buy the game, choose a difficulty level that is one level harder than the one you think you can handle. That way, the game becomes more challenging. Another small issue I had was in the options menu. Some options there are bugged and they don’t change, no matter how much you click them. Thankfully, none of these are essential. Finally, I think I should adress (for probably the first time in a review) the game’s price. Halcyon 6 costs twenty euros. Initially, you might think it’s a lot, but trust me, there are a LOT of systems present in the game. These cost precious man hours to build. And they are worth it. Moreover, the developers are still fixing the game. They have even given a whole DLC out for free. This is why I firmly believe that, if you are looking for a fun strategy game, Halcyon 6 is where you should look. You can find Halcyon 6 on Steam for 20 euros. 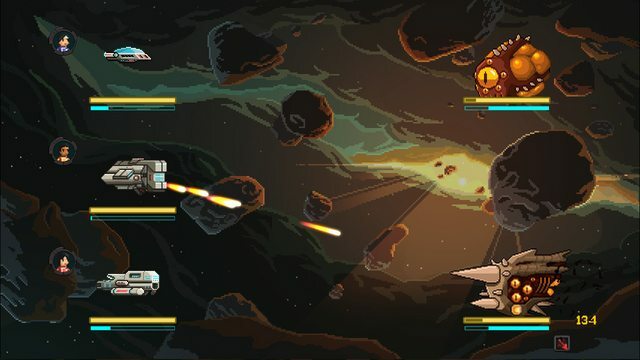 Halcyon 6 gives us an engaging space strategy game, full of depth and options for us. Although it does have some quite major problems, it is still a very fun game, worth looking into. – Some minor technical issues.